I qualified as a dentist in 1995 at the University of Stellenbosch, South Africa. Since graduating I have been in full time employment, as a general dental practitioner in the UK. I've lived and worked in North London, Norwich, Sheringham and the Falkland Islands. 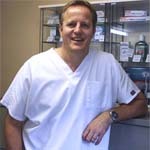 In 2008 we came across Southwoods Dental Practice. A very fortunate event that lead us to move to and settle down in Somerset. We haven't looked back since and hope to serve the local community for many more years to come. Jane qualified as a Dental Hygienist at University College,London in 1985. 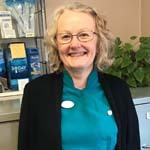 She has worked at Southwoods Dental Practice as well as Wincanton for the last 25 years. Roxanne qualified as a Medical Secretary and continued her education through dental related courses whilst living and working in Canada. 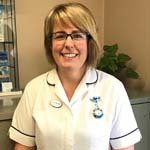 After she returned from Canada in 1995 she worked at a Dental Practice in Crewkerne, then Beaminster, before joining the Southwoods team in 2002. Leeanne joined Southwoods in January 2015 and qualified in June 2016 as a Dental Nurse through Learn Direct, after many years of being a hairdresser'. Our Patient Charter is a statement of how our Dental Practice operates and the standards of care that we apply to all our patients. It defines our responsibilities and the high standards we strive to maintain and improve upon. However, to maintain these standards also requires your co-operation and the Charter therefore also defines your responsibilities to us as a patient. To listen to your dental problems and to give you an explanation of treatment and solution to your problem that you can understand. To give you a clear and written estimate of your treatment. To respect your dignity and the choices you make. To protect the confidentiality of any information you provide. To co-operate with other members of our dental team and other health care colleagues so as to act in your best interest. To follow the latest cross-infection guidelines ensuring your safety is of prime concern. To keep up to date with the latest technologies and treatments available. To do all we can to keep to appointment times as we understand your time is precious. To respect our appointment times and let us know as soon as possible if you cannot make an appointment in order that it may be given to someone else. To pay for treatment at the end of each visit as requested. To follow any advice we may give you after treatment. To respect our dental team and reception staff as we respect you as a patient. Should the patient fail to attend two appointments, or fail to give more than 24 hours notice of cancellation (unless the patient can demonstrate an acceptable reason for the cancellation) on two occasions, a FTA fee shall be charged. Surgery time is very valuable and we ask patients to allow the appointment to be offered to another patient by giving us sufficient notice. We treat all complaints in confidence and see them as an opportunity to improve our service. Please ask for the manager or express your concerns in writing by either post or using our in-house Suggestion Box. We hope that you will use our Practice Complaints Procedure. We believe this will provide the best chance of putting right whatever has gone wrong and an opportunity to improve our practice. But this does not affect your right to approach the local PCT, if you feel that you are dissatisfied with the result of our investigation. Any violent or abusive behaviour will result in immediate withdrawal from practice.